Assassin's Creed Dives into Final Fantasy. Here's a First Look. 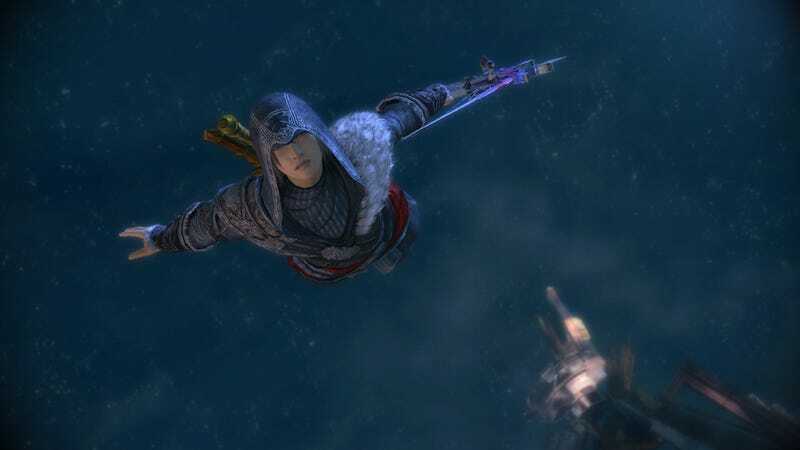 As Kotaku previously posted, Ezio Auditore da Firenze's Assassin's Creed outfit is coming to role-playing game Final Fantasy XIII-2 as downloadable content. Here are some screenshots that show Noel Kreiss, Final Fantasy XIII-2's male protagonist, decked out in AC gear. Collaborations like this are neat and all, but they also seem off putting. Like, why is Noel Kreiss dressed like Ezio? Does he know about AC? Is this just cosplay? Worlds colliding! This DLC pack will be available in Japan on April 10 for ¥300 (PS3) or 240 Microsoft Points (Xbox 360).